Dan Absalonson | Author of SciFi & Fantasy: The Third Audiobook I Narrated is Live! 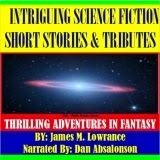 I had the privilege to narrate the book Intriguing Science Fiction Short Stories and Tributes: Thrilling Adventures in Fantasy by James M. Lowrance. This book was really fun to narrate and it covered my two favorite genres as you can see in the header of my website. There is also some excellent non-fiction in this book about UFOs and a tribute to Alfred Hitchcock. The book is well written and full of humor, intense action, and a lot of mystery. I know you'll enjoy it if you're a fan of my work. I enjoyed narrating Mr. Lowrance's work so much that I hope to do more of it in the future. He's a great writer. I'm so excited to have three professional audiobooks under my belt! Go grab your copy and enjoy. It's a short work so the price is right. Thanks for stopping by!